Spend most of your waking hours inhabiting a cube farm? Enjoy the camaraderie of being part of an office environment? Been laid off recently? If you answered 'yes' to any (or all) of these questions, then here's the book for you. 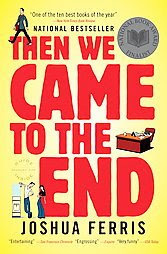 Then We Came to the End is a highly recommended novel (just check out the pages of praise inside the cover) about office life in the climate of lay-offs. Pink slips are hanging over all their heads and the stress & gossip is driving these advertising 9-5ers to all sorts of distractions. Back-stabbing, pranks, questionable behaviours, aloof bosses who don't give away any clues to their private lives...it's all in here. I just bet you'll recognize many a co-worker in this tome. To be honest, I found parts of the middle of this novel to be a bit long and tedious but overall, it's a fantasticly funny and dark account of life in the office during tough economic times. At at time when lay-offs happen more often than not, it's refreshing to read a humorous take on an upsetting, life-changing event.